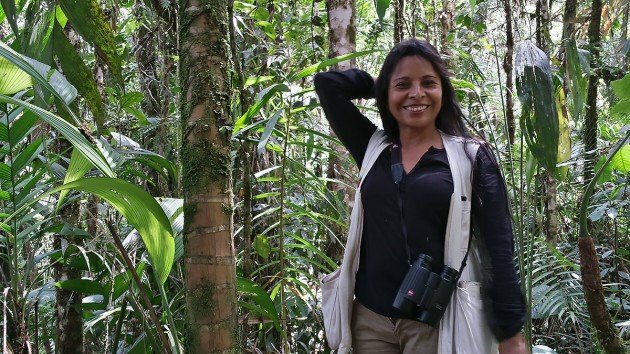 What happens when you visit one of the best birdwatching sites in the region with the highest number of endemic bird species in the Americas in the world’s birdiest country? Your mind gets blown. How else can I describe two days at Cerro Montezuma in Colombia? 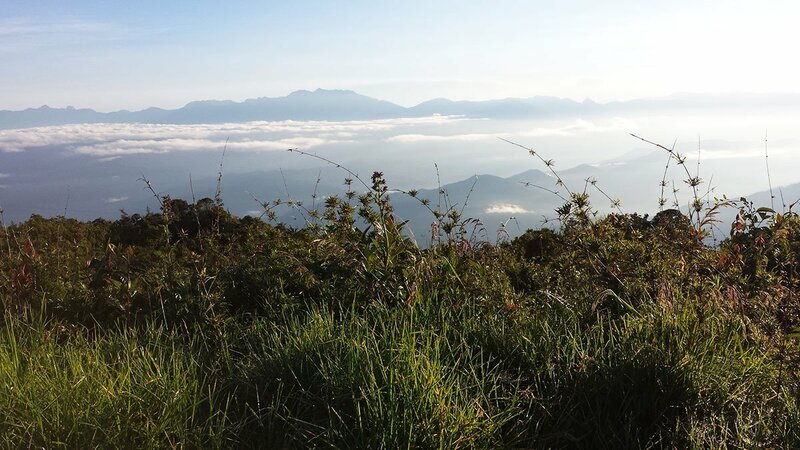 Cerro Montezuma or Montezuma Peak lies within Tatama National Park in Colombia’s Western Cordillera. (Xeno-canto has a helpful map.) The area is known for a military base, the legendary Montezuma Lodge, and a boatload of birds. 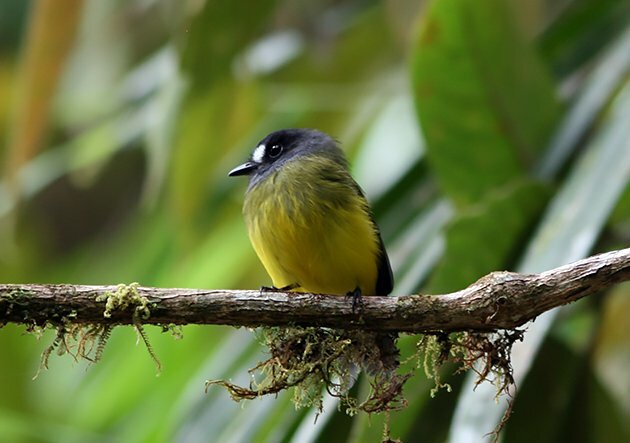 This last trait can be attributed both to the terrific verticality of this humid cloud forest and also to its location in the Chocó bioregion, an Endemic Bird Area that encompasses much of western Colombia and Ecuador. My group came to Montezuma to spy tasty Chocó endemic tanagers, hummingbirds, and anything else we could lay eyes on. I was in excellent company with Dawn Hewitt of Bird Watcher’s Digest, Emily Payne of the Daily Mail, Juan Pablo Gaviria Muñoz of Proexport Colombia, and our intrepid guide, Johnnier Arango of Manakin Birding Tours. We had just left Red-ruffed Fruitcrows behind at the excellent Otun-Quimbaya Reserve and were hungry for more. 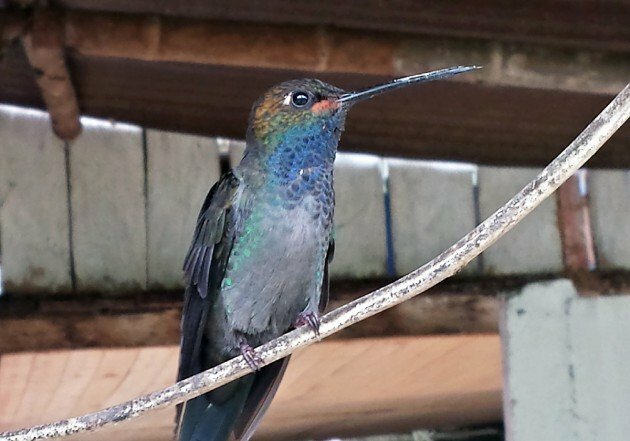 But while you come to Montezuma for the birds, one of the true revelations of the area is Montezuma Lodge and its celebrated proprietress Leopoldina. 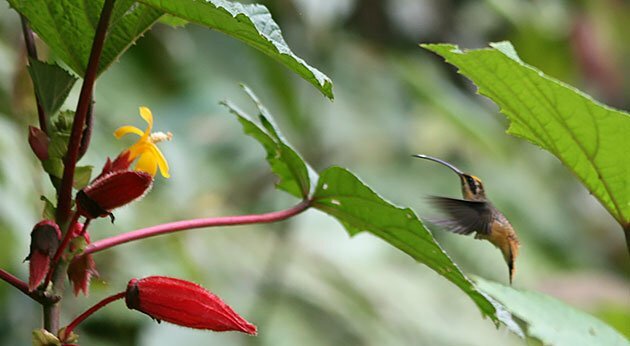 The lodge, at around 1300 meters, marks the beginning of the birding route and is surrounded by busy hummingbird and tanager feeders, as well as fish ponds that shelter Blackish Rails. Several generations of Leopoldina’s family operate the lodge, serving delicious food and hospitality in a clean, comfortable environment. The lodge doesn’t have wifi, but you won’t miss it with White-tailed Hillstars perched mere inches from your head at dinner! What made meeting Leopoldina so special was the fact that she is a birder as well who accompanied us on both our trips. Leo, as anyone who knows her can attest, has unparalleled knowledge of the birds from the top of the peak to its foot. This, of course, was a great boon for our group. Hope that you’re as fortunate to go birding with Leo! Montezuma Peak Road is generally broken up into three segments. The lowest stretch is a pleasant walk from the lodge, while the highest expanse requires hours of rough driving. The afternoon we arrived, we explored the low portion and picked up nearly 50 species in four fly-bitten hours… word to the wise, don’t wear shorts! Highlights included many endemic or localized species like Parker’s Antbird, Choco Tapaculo, Golden-bellied or Choco Warbler, and Crested Ant-Tanager. We spied 11 tanager species including the highly coveted Black-and-gold Tanager. But even that sighting paled compared to a completely unexpected Chestnut-crowned Gnateater, which was even a lifer for Johnnier! Setting out in the middle of the night put us in position for an even more exciting morning. The first rays of the sun found us at around 2300 meters atop Cerro Montezuma. Here above the clouds, we found three coveted species in a row: Rufous Spinetail, Chestnut-bellied Flowerpiercer, and Munchique Wood-Wren. That last bird, split not that long ago from the Gray-breasted Wood-Wren, was much more confiding than its frustrating kin, not that I got a picture! 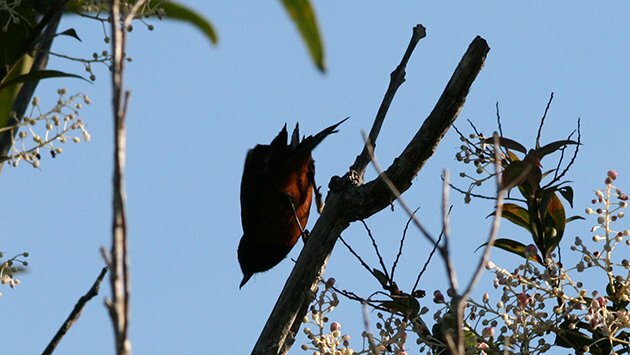 Not the best shot of a Chestnut-bellied Flowerpiercer, but isn’t it nice to see one? As we worked our way down the mountain, birds ran hot and cold. Sure, we missed out on serious targets, only hearing species like Plumbeous Pigeon, Yellow-breasted Antpitta, Glossy-black Thrush, and Narino, Spillman’s, and Alto Pisones Tapaculos. But the birds we did see were stellar! Who could walk away from encountering 11 species of hummingbirds in one morning and not feel fortunate, especially when the lot includes crowd pleasers like Tawny-bellied Hermit, Tourmaline Sunangel, Violet-tailed Sylph, Greenish Puffleg, Brown Inca, Velvet-purple Coronet, White-tailed Hillstar, Green-crowned Brilliant, Empress Brilliant, Purple-throated Woodstar, and Andean Emerald? Speaking of large numbers of gorgeous birds, we rustled up 12 species of tanager this time, including jaw-droppers like Gold-ringed Tanager, Purplish-mantled Tanager, Glistening-green Tanager, and both Blue-winged and Black-chinned Mountain-Tanager. Gold-ringed Tanager!! Of course, the 67 species we saw in the upper and middle segments of Montezuma Peak Road included more than hummers, tanagers, and flycatchers. 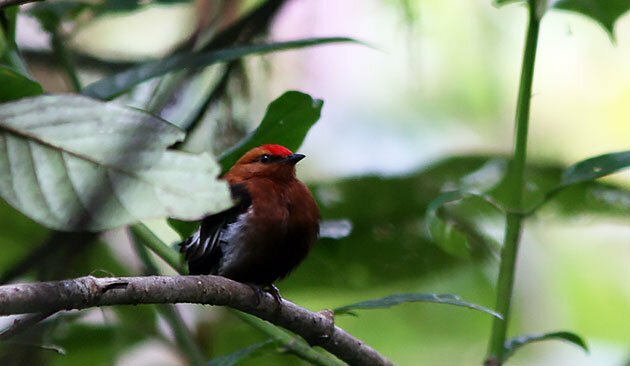 We spotted both Golden-winged Manakin and Club-winged Manakin, the latter a displaying male at a known lek. The Club-winged Manakin, pictured handsomely in the photo at the top of this post, is one of the star attractions of the Chocó region, as anyone who has observed their freaky mooning display can attest. We also lucked into great views of Black Solitaire, decent views of Green-and-black Fruiteater, and horrible partial views of Chestnut-breasted Chlorophonia. Swooping Swallow-tailed Kites and a variety of warblers, brush-finches, seedeaters, and ovenbirds, not to mention exquisite non-avian fauna and flora (including a rampaging cow! ), completed the experience. Actually, that last statement was misleading. The experience, as magical as it was, feels far from complete. 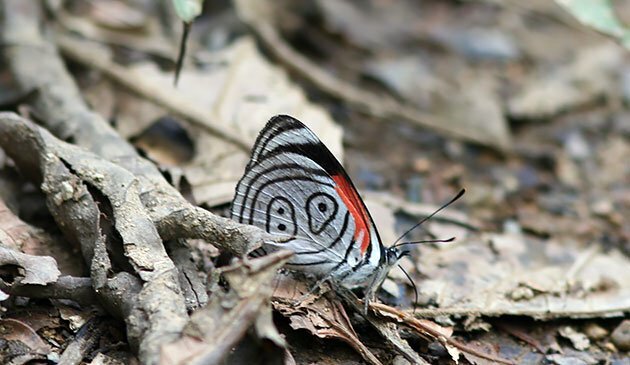 With nearly 100 species in 24 hours, we merely scratched the surface of what Cerro Montezuma and the larger Tatama National Park area has to offer. The type of birding I typically favor involves skimming a place for its specialties before moving quickly to the next one. Yet I could imagine spending a full week or more exploring everything this magical mountain area has to offer. Put Montezuma Peak on your bucket list and tell Leopoldina I sent you! 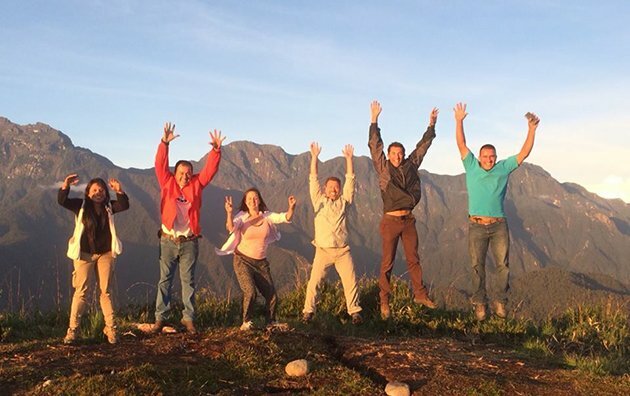 On top of Cerro Montezuma… oh, what a feeling! Thanks so much for this amazing article,,, this is really nice, we are so happy that you enjoyed the time in Montezuma, a very good example that is possible to make excellent tourism with low resources and the best thing to support the local economy of the country people in Colombia. Will be so great to have more visitors in Montezuma, this people really are doing a good job! Thanks again for your words about Monteuzma!